Cavity trays are most commonly retro-fitted to properties during the construction of an extension to turn an external wall into an internal wall. 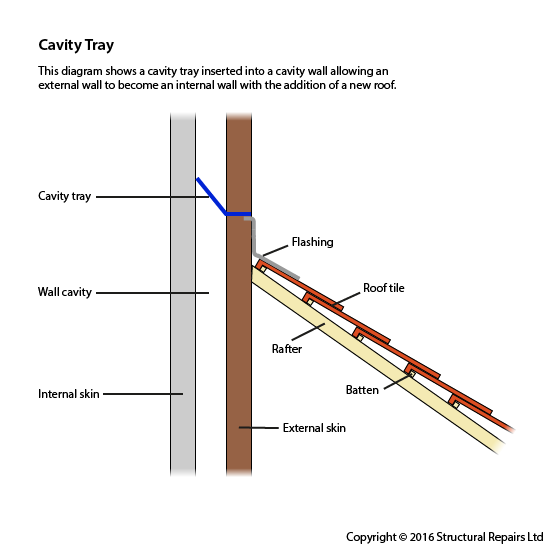 A cavity tray is inserted into the external skin of a cavity wall to form a barrier between two courses of bricks. It is used to prevent moisture flowing down through the wall and bypassing external features such as a lead flashing on an extension roof. Cavity trays are often used above door and window openings. Failure to install a cavity tray means that water penetrating an exposed area of wall above an extension is able to run down, past where the new roof joins the wall, to create damp in what is now an internal space below. The task of retrofitting a cavity tray is seen by many builders as a laborious and troublesome task that has only a negligible benefit and, since it is often not checked by Building Control, is not given the necessary importance. Cavity trays are very important and if omitted can cause problems with damp and in some circumstances water might come pouring in. Please contact us if you have any concerns about a cavity tray, mould, or any other damp issue.